biolitec Pharma Ltd. is a company within the biolitec group and responsible for the production & marketing of Foscan® for the palliative treatment of advanced head & neck cancer. We are also responsible for developing further indications for Foscan® and the clinical development of the Photodynamic therapy (PDT) photosensitiser portfolio within the biolitec group. biolitec Pharma Ltd. is headquartered in Dublin, Ireland and has a branch office in Jena, Germany. The biolitec group is also a leading developer and manufacturer of diode lasers, optical fibres and accessories for application in a wide range of medical specialties. 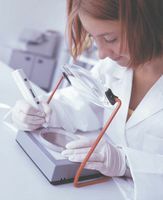 The combination of CeramOptec brand of diode lasers and medical & industrial fibres and biolitec pharma, the manufacturer of Foscan® makes the biolitec group unique in providing all core competencies for Photodynamic therapy – lasers, fibres & photosensitisers. The biolitec group is headquartered in Vienna, Austria and has subsidiary manufacturing and sales sites in Germany, Ireland, France, Malaysia and Latvia (amongst others). Our goal is to support the development and sales of applications that demonstrate improved clinical benefit, cost efficiency and to provide the complete laser, fibre, accessory and/or photosensitiser solution.